People who have a strategy tend to save more money and be financially healthier than those who don't, studies have found. For example, those who thought about retirement – "a lot," "some" or even "a little" – approached retirement age with twice the wealth of non-planners, according to a 2007 Pension Research Council study. Another study in the Journal of Consumer Affairs in 2011 found that simply using a retirement calculator increased someone's likelihood of saving. Parents who created a plan to pay for their children's college educations saved 76 per cent more than parents who saved but didn't have a plan, according to Sallie Mae's How America Saves for College 2016 report. Households that plan for large, irregular expenses are 10 times as likely to be financially healthy as those that don't, according to a study published in 2015 by the Center for Financial Services Innovation, a non-profit trade group that promotes financial health. The centre's study defined "financial health" as having emergency and retirement savings, sustainable debt loads, good credit scores and property, life and health insurance. 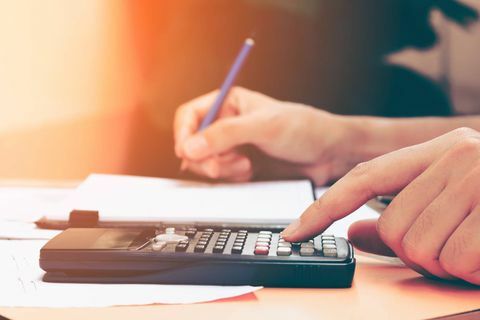 While the health of one's finances tends to rise with income, age and education, the study discovered that the propensity to plan had an even greater effect than those other factors on predicting who's financially sound. It's important to note that people who plan don't just focus on long-term goals, such as retirement and college. They're also planning and saving for the near term, including expenses that will come up next week or in three or six or 12 months. You can't dream about a debt-free future without a plan to pay tomorrow's bills first. "Just planning ahead for my next car insurance bill in August and socking away $50 a month means that I'm ready when it comes," says Jeanne Hogarth, vice-president for policy at the Center for Financial Services Innovation. "The challenge for families is to figure out what all those large irregular expenses are across the year and to factor those into their planning and set-aside accounts." ARE YOU TOO WORRIED TO PLAN? Anyone who's been broke knows how hard it can be to think ahead even a little bit when you're busy coping with today's problems. In fact, our brains are wired to make matters worse when we don't have enough of what we need, say Sendhil Mullainathan, a Harvard University economics professor, and Eldar Shafir, a Princeton University psychology professor, co-authors of "Scarcity: Why Having Too Little Means So Much." People struggling to make ends meet are so focused on solving their immediate problems that they have less mental energy to deal with anything else, the professors' research found. That preoccupation affects how well we think and makes it more likely we'll forget things and make mistakes. We fail to remember to pay a bill or a looming expense. We grab high-cost loans that make it even more difficult to pay the bills next month. Being preoccupied with money problems can drop our IQs by 13 points, or about the same amount as staying up all night, the scarcity research found. On top of that, scarcity impairs our ability to resist temptation and control our impulses. What helps, Mullainathan and Shafir say, is what they call "slack," or small cushions to help ease the cognitive load. For the time-strapped, that means keeping a few 30-minute slots open during the day to deal with unexpected events. For the financially strapped, "slack" means a small rainy-day fund. Even a few hundred dollars in savings can help cover a minor car repair or insurance deductible, but more importantly it can ease the cognitive load that comes from living paycheque to paycheque. Next, get into the habit of saving. Financial advisers like the "pay yourself first" mode, which means putting aside money each month or each paycheque before paying other bills. But financially healthy households may use other planned ways to save, such as banking the income of one spouse and spending the other's or spending regular income and saving gifts, tax refunds or bonuses, says Rachel Schneider, senior vice-president at the Center for Financial Services Innovation and co-author of "The Financial Diaries: How American Families Cope in a World of Uncertainty." How you do it is less important than that you do it. Once you have the savings habit, you can start planning – even if it's just a few weeks or months ahead. "We have a real tendency in personal finance and economics to think that the core challenge is to get people to not overspend today, in favour of saving for the distant future," Schneider says. "But often what people most need is to save and plan for the near-term." - This column was provided to The Associated Press by the personal finance website NerdWallet.